May the Schwartz Be With You: The Schwartz's vs Sarah's "Wii"
The Schwartz's vs Sarah's "Wii"
Chris and I bought a Wii about 3 years ago. We love it. But I'm pretty adamant that at this stage in Sarah's life she has no idea what it is. So we don't turn it on while Sarah's awake. That's not to say that when she's older we won't let her play. We definitely will; one of the reasons why we bought it was to play games like bowling and what not with the entire family. So when Sarah's walking around the house saying "whee!" she's talking about her new swing set that Grandma and Grandpa Smith bought her. She loves it and it's definitely made this beautiful weather we've been enjoying a lot more fun. If it's not raining, then we're outside playing (hence the lack of blogging). 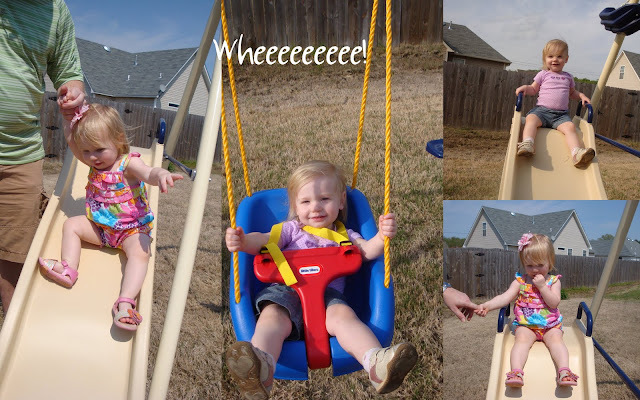 Her love of her swing set has also added a new word to her vocabulary. She now says "outside" and "outside, pleeeeese". It's adorable. I was trying to only take her to her swing set from the back kitchen door hoping that she wouldn't connect the front of the house to the back of the house. Unfortunately, my child can't be tricked. So the other day she was supposed to be playing with her balls and her car in the front yard while I was weeding the flower bed I looked up and she was gone. (Not in that scary oh my gosh my child has been abducted kind of way, but in the oh crap, she realized the front yard is connected to the back yard.) And so I start walking behind the house following the sound of "Whee. Whee. Whee. Wheeeeeeee!" as she goes running to the swing set and starts patting the swing saying "up, pleeeese". She even goes down the slide all by herself now. Well, she needs help being put at the top of the slide but she'll sit there and push herself down when she's ready. It's so cute. We're trying to get the most use out of it now before the crazy million degree heat and 200% humidity of summer kicks in. We'll still go outside and enjoy it every day, but for shorter time spans.